Rohingyas reiterate demands for Myanmar citizenship. Repatriation of Rohingya refugees to Myanmar will begin “as soon as possible,” the country’s minister for relief and resettlement, Win Myat Aye, said during a visit to refugee camps in Bangladesh. “We can overcome all difficulties,” the minister said on Wednesday as he began a two-day visit to Bangladesh. The landmark visit to the refugee camps is the first by a Myanmar Cabinet member since the Rohingya exodus began last August following an army crackdown in Rakhine state. During the visit, the minister promised Rohingya refugees they would be provided with national verification cards (NVC) on their return to Myanmar. 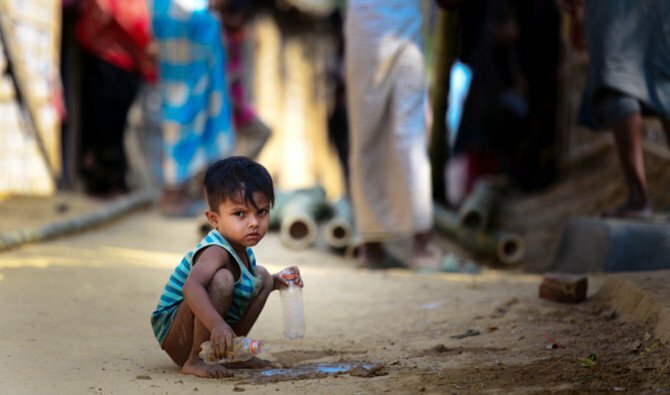 However, refugees rejected the “NVC idea” and reiterated their demands for Myanmar citizenship, Abul Kalam, a member of Bangladesh’s Relief and Repatriation Commission, told Arab News. Win Myat Aye visited the Kutupalong and Cox’s Bazar refugee camps, and met UN officials and aid agency representatives. The Myanmar government has verified only 700 people from a first list of 8,000 Rohingyas provided by Bangladesh for verification. A second list of 10,000 Rohingyas will be handed over to Myanmar this month. “We are yet to have a specific date of repatriation. Today, we did not have any discussion in this regard,” Kalam said. Win’s visit has stirred mixed reactions among Rohingya refugees in Cox’s Bazar. “We want our citizenship rights in Myanmar,” said Abdur Rahman, 39, who has lived in the Kutupalong camp for seven months. “What else do we seek from the Myanmar minister?” he asked. The visiting Myanmar minister is due to meet Bangladeshi Foreign Minister Abdul Hassan Mahmud Ali on Thursday for detailed discussions on repatriation.